3 Bedroom End of Terrace House For Sale in Warrington for £149,950. Offered with the advantage of no onward chain is this extended three bedroom home that must be viewed early to avoid missing out. Located close to Honiton Way shopping precinct and benefiting from a newly fitted bathroom suite, this property will stand out from others that have been offered for sale previously. The property has also been extended the full width to the rear and boasts a large open plan lounge with access to a separate dining room which allows access to the rear garden with a modern kitchen positioned to the front with a comprehensive fitted suite. An integrated garage is perfect for storage but could also further enhance this great home by way of a conversion to create additional living accommodation. The first floor offers three equally sized bedrooms with the recently installed family bathroom serving all bedrooms and with a boarded loft, ideal for storage, being accessed via a drop down ladder. 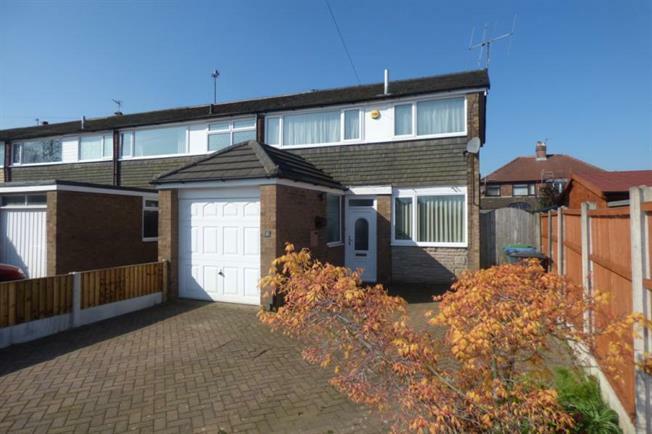 Externally there is a block paved driveway to the front providing plenty off-road parking and with a low-maintenance garden to the rear with the garage benefiting from a pitched roof.